"Cumin-spiced pumpkin replaces beans and beef in this recipe for a perfect filling for soft or crispy tacos. Top with tomatoes, onions, and cilantro." Heat the oil in a large skillet over medium heat. Cook the pumpkin in the heated oil 2 to 3 minutes. Stir in the vegetable stock, cumin, salt, and pepper. Cook until the pumpkin cubes are easily pierced through with a fork, 5 to 7 minutes. Fill warm tortillas with pumpkin; top with tomato, onion, avocado, and cilantro as desired. I was really excited to try this recipe but also found that it was a little bland. I cooked butternut squash instead of pumpkin, with the onion. 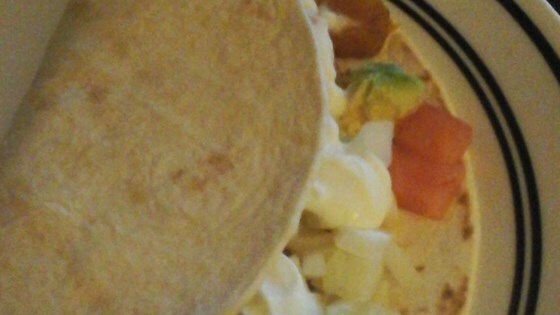 This recipe made a great tasting filling inside of homemade whole wheat tortilla shells! Absloutly wonderful. But dont expect similar flavor or texture to beef tacos. Sorry, but I found the filling for the tacos to be pretty bland. I used corn tortillas and they were all you could taste...plus they crumbled and resulted in a very messy meal! I used a different winter squash in place of pumpkin, but I bet the taste is not far off. The onion and tomato taste fantastic with the squash flavor. Definitely a keeper.